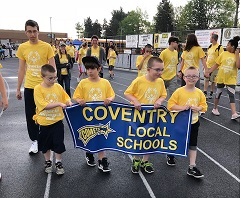 As the 2017-2018 school year is coming to a close, so is my 10thyear as Special Education Director for Coventry Local Schools. Looking back on this school year there have been some wonderful things that have taken place. Back in the fall, an internal monitoring team was created with special education staff from each district school building. This team was trained to view IEP’s for compliance related issues. We completed an in-house audit and were able to come up with areas that we as a district want to work on. The team members are also paired up with staff in their buildings to help answer questions in a more efficient manner. We look forward to our team gathering again in the 18-19 school year and seeing our progress. 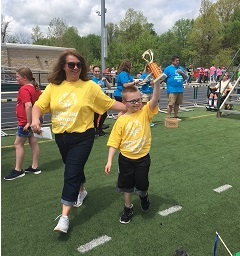 On March 8th, Stacey Hartwig, Coventry’s Parent mentor, put together our annual student recognition night. We had 39 families attend, and 27 students were recognized for their hard work this year. Also in April we had two students, Elijah Strickland and Claude Debord represent Coventry at the SST 8 Awards Gala. We also had three staff members recognized that day. They were Mary Brown, Amanda Wood and Shari Lutton. 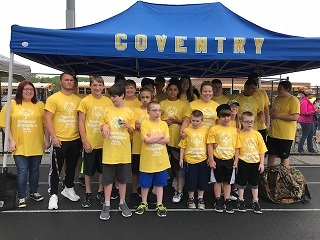 Most recently on May 15th, 9 of our students participated in a region wide Special Olympics track and field day. To say the students enjoyed themselves would be an understatement. Each student was paired with a general education student to be their personal coach. Someone once said, “A picture says 1000 words” and we hope these pictures tell you the story of our day. Looking forward to the 18-19 school year, we are excited to welcome around a dozen students transitioning to kindergarten with us from our special needs preschool. We also hope to provide opportunities in the community for our oldest students who will be transitioning to adult services in the next few years. Our internal monitoring team will continue to look over our documents and attend trainings as needed. Finally, the district will continue to look at the continuum of services we provide to ensure students are being taught in their least restrictive environment. As my 10th year is wrapping up, I look forward to the positive changes that will be taking place in year 11 for the special services department.